Fahadh Faasil is in top form in Maheshinte Prathikaaram, feels Paresh C Palicha. Malayali directors can tell stories of commoners very well. The latest one to join the long list of realistic filmmakers is Dileesh Pothan, who makes his debut as a director with MaheshintePrathikaaram (Revenge of Mahesh). His hero is a photographer in a hilly township, where modern amenities are yet to reach and people are still simple. 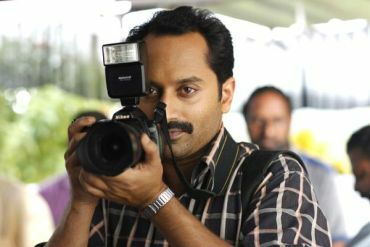 Mahesh (Fahadh Faasil) lives with his father and is an epitome of simplicity and is shown doing daily chores. The woman in the house is missing and there is no explanation for that. The script by Shyam Pushkaran languidly proceeds to show the lifestyle of the people in and around the township. Mahesh has a childhood sweetheart in Soumya (Anusree), who is working as a nurse in a distant city. Their love story is known by all around them and there is no visible opposition in their union. But Soumya's father (IdukkiJaffer) finds a male nurse working in Canada as the ideal suitor for his daughter, and is able to convince his daughter that his choice of life partner for her is better than hers, as she will be able to see the world if she agrees to his choice. Obviously, Mahesh is heartbroken but does not seem to have the gumption to fight his fate. The story till now reminds us of the best of Mohanlal's films in his prime, in which he is made to sacrifice his personal wishes and dreams being the sole breadwinner in a large middle class family. But this being a 'newgen' film, our hero gets an opportunity to be a hero in the real sense, which gives a specific meaning to the title and forms the crux of this tale. The plot is driven by characters and their reactions to a particular situation, and there is no solid form of story where we see a growth in characters or logical progression in the story. Even the success that Mahesh achieves in the end is not heroic enough in the real sense of the world but is either luck or fate if we like to give a name to it. The vulnerability of Mahesh is intact throughout even though he presents a brave face to the world and his show of confidence is more of acting as we are shown moments when he is alone and breaks down. But his moments of weakness are hidden from the world around him. One more thing to be happy about this film is to find Fahadh Faasil in top form as far as acting goes. We don’t see him as an actor or a star, but the character living a life and going through real life experiences. The same can be said about the other actors around him too whether it Baby Chayan (Alancier) who is an elder guide to Mahesh, or Crispin (Soubin Shahir who brought the house down as the PT Teacher in last year's hit Premam), who works as an assistant to Baby Chayan. Anusree and Aparna Balamurali, who play the leading ladies in the first and the second half respectively have got solidity of writing in their characters which give their characters complexity and depth that is rarely found these days. They illuminate the film with their performances. In all respects, MaheshintePrathikaaram is a winner and gives us one more director to watch out for.